I have a small LCD TV on my desk, next to the computer monitor. It's there to keep me company as I putter around researching material for my Blog. 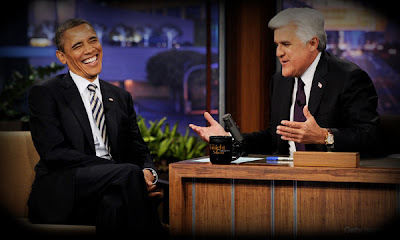 Normally I am not a fan of the "Tonight Show" with Jay Leno. I have fond memories of kicking back in our dorm TV room, watching Johnny Carson and the "Tonight Show" - "broadcast in black and white and compatible color." 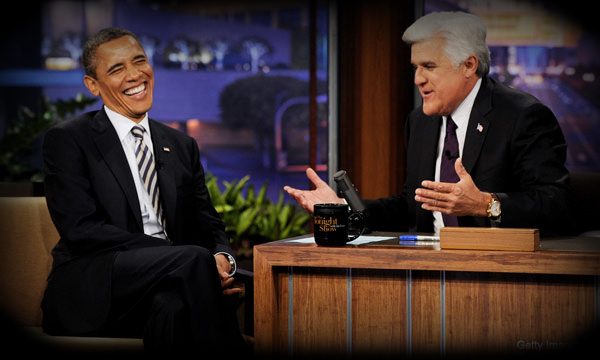 Working late last night, I suddenly discovered President Obama on the tube with Jay Leno. How fortunate we are to have such a great man as President of the United States. He is smart, intuitive, can actually string compound sentences together, quick to smile and laugh. His anecdotal comment to Michelle to start giving out candy instead of healthy treats on Halloween "lest the White House get egged!" brought the house down! Who envies the struggle he has to steer this country through the existing political quagmire? Link: Complete interview with Jay Leno. It would have been nice to see Obama unteract with Floyd R Turbo, Karnak the Magnificent or some of Johnny's other original characters. But I echo your sentiments about Obama's ability to roll with the comedic punches.